We’re here today with a friendly reminder that in less than two weeks, Google will be retiring the Google Affiliate Network (GAN). If you haven’t yet migrated your company’s program to another great network (LinkShare, Commission Junction, and ShareASale are just a few examples of the strong contenders for your attention), there’s no time like the present—especially because many of these companies are seizing this major opportunity to recruit new clients and help them with their transitions. You should be able to get an excellent deal on a new account that really works for your business’s unique needs, along with ample hands-on support from the experts. As you migrate from GAN, Consorte Marketing has many more great post-migration tips for you on page 5 of the current issue (23) of FeedFront Magazine, which you can read for free. It’s important that you act now, so that you don’t lose any (or all!) of the valuable data you’ve stored on GAN when it retires on Wednesday, July 31. Making a seamless and well-planned transition to a new network will save you and your team countless hours of unnecessary and frustrating busy work. With this in mind, it’s understandable if you find the entire process daunting—but know that it doesn’t have to be. If you don’t feel that you can address affiliate network migration from within your company, don’t hesitate to reach out to a highly qualified dedicated affiliate manager for help. Collaborating with an experienced and knowledgeable partner will ensure a smooth migration process and build your company’s strongest affiliate program yet. 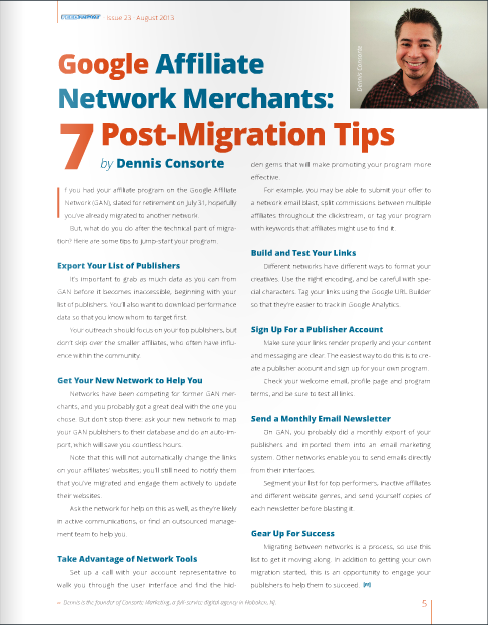 Dennis Consorte provides tips on post-migration, to affiliate network merchants. 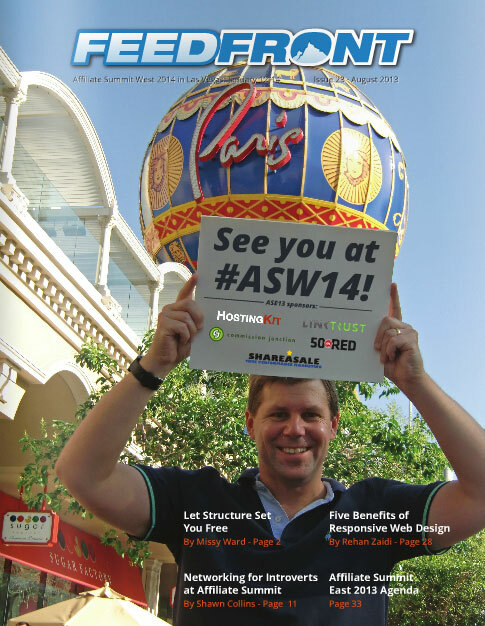 Posted in Affiliate Marketing, Marketing Tips. Tags: affiliate tips, commission junction, gan, google affiliate network, linkshare, share a sale.